Nduja Artisans Nduja for sale. Buy online at Zingerman's Mail Order. Gourmet Gifts. Food Gifts. Spicy Calabrian pork spread made with heritage pork in Chicago. Eating 'nduja for the first time always counts as a significant experience. I pretty much guarantee you’ll remember it. First off, it's spreadable meat—very memorable in and of itself. A pork spread that’s spicy, slightly sweet, buttery, powerfully porky yet as smooth in texture as homemade strawberry jam. 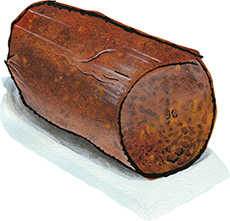 Chicago’s Antonio Fiasche is a fifth generation 'nduja maker whose grandfather still lives in Calabria, Italy, not far from 'nduja’s hometown Spilinga. Tony uses only pork from sustainably raised old-school Berkshire hogs, a proprietary blend of five different chiles, and ages his 'nduja for months. What to do with it? Just about anything. Spread it on toast or a burger. Mix it into tomato sauce or scrambled eggs. Eat it with crackers, cheese, and pickles. Cut it with some ricotta and make a sauce.